"If we're gonna be asking big questions, we have to be ready for the answers." Why anyone would want to mess with bringing people back from the dead after movies have already illustrated what a bad idea that would be is beyond me. But here we are with The Lazarus Effect, a movie that basically feels like a remake of Flatliners. Olivia Wilde and Mark Duplass star in the film about a group of medical students who have been experimenting with bringing animals back from the dead. And when Wilde ends up in a fatal accident, she becomes a prime candidate to be the first human trial, but the results are not good in the least. Also, does the title remind anyone else of this pivotal scene in Casper? Just me? Okay. Watch the trailer! 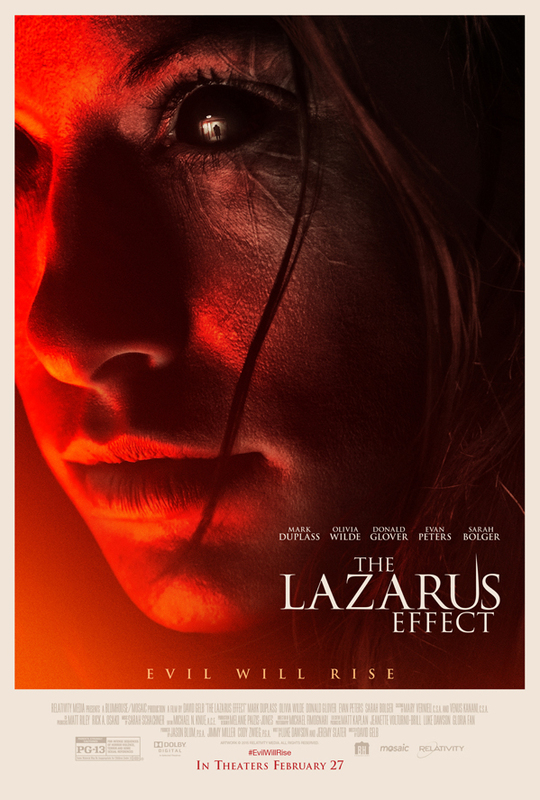 The Lazarus Effect is directed by David Gelb (Jiro Dreams of Sushi) and written by Luke Dawson (Shutter) and Jeremy Slater (2015's Fantastic Four). Olivia Wilde, Mark Duplass, Donald Glover and Evan Peters play a group of medical students experimenting with dead tissue and the ability to resurrect it. But when an accident leads to Zoe's (Wilde) death, Frank (Duplass) decides to bring her back after a successful experiment in bringing back a dog seemed to go well. However, with Wilde's resurrection comes terror, fire and death. Relativity Media releases the film late next month on February 27th. Anyone interested? Oh Mark you're so much better than this. Ahhh this trailer just gave me so much less hope for the new Fantastic Four. Fantastic Four? I don't follow. I hope so, man I hate Community. Yeah I don't get why they basically showed the death of a supporting character in the trailer. Why does the black man always gotta die?! Poor Donald Glover... Anyways, haven't seen Flatliners but this doesn't look good to me. Haha noticed that too. Too bad we know how he dies. Now his character means nothing in the movie. Haven't seen Flatliners!? And on a movie site?! Get outta here & watch it!! 😉 Pretty good, all star cast, no idea how it aged. Heh! As a person on a movie blog... I'd say it's mandatory viewing for you, if nothing but for the nostalgic/historic value. Definitely entertaining if nothing else. It's early 90's-riffic!! Why do they always use the same typography and background texture for promoting these films. Sigh. mark duplass could do a lot better than this. Is it finished? I fell asleep there. That first shot looks familiar. On a positive note the chemistry between Olivia Wilde and Mark Duplass should be decent since they worked together on "People Like Us"
Actually looks very good. Duplass is kind of blowing up?! I dig that. WHY DID THEY JUST SHOW DONALD GLOVERS DEATH SCENE!!! !